Say hello to happy feet and more happiness will follow. 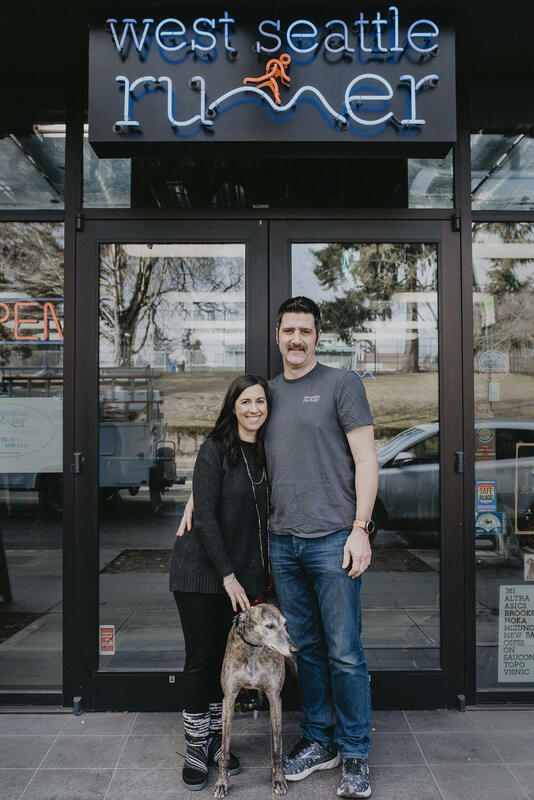 Lori and Tim McConnell (aka dynamic duo married 18 years) will professionally fit you head to toe in running gear and invite you to join their community called West Seattle Runner, a nucleus of like-minded people who aim to live healthy lives. A spacious, well-designed store off of California where runners are supported, literally and figuratively with nutrition and a plethora of products to enhance your running or walking, whichever speed you go. You can zip, run, walk or saunter into their store for a bevy of products made just for the sure-footed and not so sure-footed athlete, “we have you covered” they will assure you. And they do. Running bras, jackets, pants, socks and yes, energy bars and goo. “When people come in they may be hopeless, say they can’t work out again. We offer a place where they can get resources to run again and if they want, to become fast,” Tim said. Running brings a natural high loaded with invigorating endorphins and the satisfaction you’ve moved swiftly from one place to the next. You can exercise your mind, body and soul through movement. This is a fact. West Seattle Runner is created for those who want, need or are living a lifestyle focused on good health and community. The dynamic duo, continue to help hundreds of people discover and rediscover running. A customer who was unable to walk more than a block came to West Seattle Runner in preparation for a European trip. Over the course of a few months, she gained friends, lost 70 pounds, prepared for and ran two half marathons (in just a week!). There are more stories very similar to this one. “You do the work (i.e. the exercise), we’re offering advice, a product and a place to meet other runners,” Lori said. A desire to run a successful business is certainly a commanding factor for Lori and Tim’s hard work, yet it’s the customer’s triumph in walking and running pain free that’s the driving force. All are welcome to become part of the running community. Your feet will be happy and your hearts will be full.